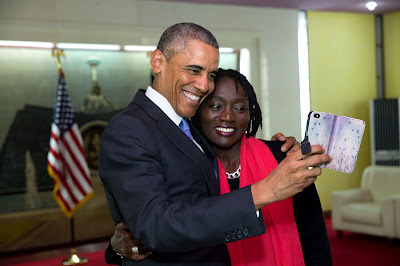 Taking a selfie with his sister Auma Obama at the Safaricom Indoor Arena. however, we all know his car is christened "The Beast". The United States President, Barack Obama, made the first tour to Kenya by a sitting US President. During the trip, there was a consistent theme in the media about Obama bringing “goodies”, though much focus was placed on his motorcade and other theatrics. State House has released some details on the goodies that Obama brought. A good number of them are not the tangible goodies we may expect, such as new, black roads, or new, gleaming railways. There’s however some aspect of that. It is a mixed bag of goodies, some heavily skewed towards US interests, but a good number are to our interests. They especially focus on the space of human development that is often ignored in the pursuit of physical development in this region. Thus, there is a theme in human rights, and especially those of women and girls, and an overall objective towards increasing the value and quality of people in Kenya, and in Africa. Some of the agreements involve several African countries. While Obama only visited Kenya and Ethiopia, the rest of Eastern and Southern Africa also did get something from the goody bag. In brief, here are key takeaways. US contractors might get some preference, either by being actively invited to bid, or in some other way. The US is quite specific on the observance of human rights and environmental conservation on the deals it will be involved in. This is something the Chinese tend to overlook, leading to disputes and environmental degradation. An agreement looks to focus on “biological threats of mutual concern”. This looks like a biological weapon/warfare detection lab, which will also double as a lab to identify other toxins and biological threats. Some intellectual property is expected, and will be co-owned with the US. It may also have something to do with the risk of viruses and other disease causing organisms such as Ebola. Africa is usually noted as a region where these emerge. So this may be some sort of lab to serve Central Africa/East Africa/Middle East - my thoughts. Caveat. The Global Health Agenda seeks to stop future disease outbreaks in 17 countries, including Burkina Faso, Cameroon, Cote d’ivoire, Ethiopia, Guinea, Kenya, Liberia, Mali, Senegal, Sierra Leone, Tanzania, Uganda, Bangladesh, India, Indonesia, Pakistan and Vietnam. Partnering with Africa(42 countries) on food security and climate change adaptation. Open Governance Partnership, of which Kenya is reinvigorating. Focus to increase transparency, bolster citizen engagement,and harness new technologies to improve governance.” Think Kenya Open Data. Stolen Asset Recovery and Global Asset Recovery Focal Point Initiative. Nigeria stands to benefit a lot here. Support of free and fair elections. Support of elections in Uganda, Somalia and Southern Africa. Support of 2017 elections in Kenya especially encouraging of women, youth and disabled individuals in the election process . $0.8 million(KSh. 80 million) 3 year wildlife poaching and trafficking assessment programme in Kenya. Legal support and technical assistance to governments and civil society to limit issuance of negative laws and minimize negative impact where they are in place. Equal Futures Programme to promote domestic reforms to remove barriers to economic and political empowerment of women in Benin, Morocco, Mali, Senegal, Sierra Leone and Tunisia. 1.2 million to help multiple countries in sub Saharan Africa develop or implement national action plans for women, peace, and security. Advancement of rights of Lesbian, Gay, Bisexual and Transgender people and their inclusion in development. Rebuild key justice and security institutions in Mali. Let Girls Learn programme in some African countries and Global Give Back Circle in Kenya to guide disadvantaged girls to complete their education from upper secondary to university, gain employability skills, and become agents of change. $210 million (KSh. 21 billion) to Determined, Resilient, Empowered, AIDS Free, Mentored and Safe (DREAMS) partnership which will aim to reduce HIV infections in adolescent girls and young women in Kenya, Lesotho, Malawi, Mozambique, South Africa, Swaziland, Tanzania, Uganda, Zambia and Zimbabwe. Joint Commitment to Promote Good Governance and Anti-Corruption Efforts in Kenya. “Objective to improve governance by increasing transparency and accountability in Government, and commit to work together to combat corruption in Kenya. The two Governments plan to meet quarterly to review progress in implementing these commitments. Government of Kenya to expand and launch new civic education and awareness programmes. Integrate the same in school curriculum. Compulsory ethics training for all public officials across all levels of government by National Anti Corruption Steering Committee. Government of Kenya to launch Code of Governance (Mwongozo) for State Corruptions to institutionalize good governance. Work with World Bank to conduct risk assessment on money laundering and terrorism financing. Full implementation of new money laundering rules and regulations. US Government to provide best practices and advice on anti corruption regulation, including support of Attorney General’s office. Transparent decision making on decision making and financial flow of Extractive Industries (Mining). GoK to implement Extractive Industries Transparency Initiative (EITI). US to share EITI experience. GoK to release second Open Government Partnership (OGP) National Action Plan within 6 months and fully implement commitments in it. GoK to finalize complaints and corruption reporting web portal by December 2015. GoK to complete digitization of lands,birth and death records by July 2016. Prioritize business registration and other highly demanded public records starting August 2016. GoK to further enhance Integrated Financial Management Information System program (IFMIS) towards full integration of all government financial systems. GoK to augment audit and security components of IFMIS to guarantee its integrity. GoK to utilize eProcuremnt to eliminate corruption in awarding of licenses and contracts. GoK to fully move to eProcurement by July 2016. GoK to overhaul whistleblower legislation. US to undertake “scoping mission” to evaluate providing grant assistance to implementation of eGovernment systems by end of 2015. Target corruption in transport sector through increased efficiency and transparency under the Border Control and Operations Coordination Committee. US and Kenya to exchange delegations to study best practices on port management and procedures. Explore possibility of developing a Cargo Tracking System to create an electronic shipping manifest and identify high risk shipments based on profiles. GoK to sustain corruption investigation and prosecution through Ethics and Anti-Corruption Commission (EACC). GOK to develop capacity for an agency to fight transnational crimes, and for the agency to partner with the US on the same. Agency to investigate corruption associated with wildlife traﬃcking, drug smuggling, money laundering, and other cross-border criminal activities. By late 2015, the U.S. Government also plans to provide technical assistance to the IPOA, the National Police Service Commission, and the National Police Service’s Internal Aﬀairs Unit to help them enhance police accountability . GOk to strengthen capacity of Financial Reporting Centre and Central Bank of Kenya to track illicit financial flows. US and Kenya to work on cases of mutual interest. Through 2015-2016 US will work to provide $465 million through Counterterrorisms Partnership Fund(CTPF) in new equipment, training, capacity building and enabling assistance to partners in Africa. In 2015, provide $40 million(Ksh. 4 billion) in countering violent extremism in East Africa (CVE). Empower youth at risk of radicalisation in Kenya through the “Yes Youth Can” initiative. Ongoing Africa Peacekeeping Rapid Response Partnership to build capacities of African armies to rapidly deploy peacekeepers in emerging conflicts. Includes Ethiopia, Ghana, Rwanda, Senegal, Tanzania and Uganda. Early Warning and Response Partnership (EWARP)supports information sharing, conflict prevention, and crisis management among West African states.